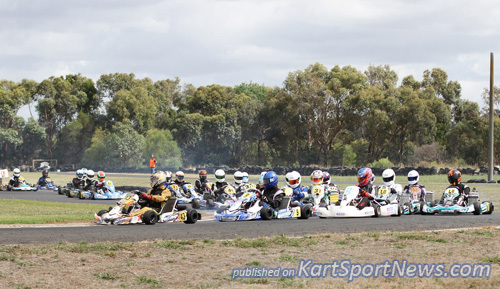 The South West Kart Club in Cobden hosted the start of the ‘AUSTRANS Victorian Country Series for 2016 with 205 entries joining in the action with plenty of familiar faces along with a few new amongst the day’s action across fourteen classes taking part. 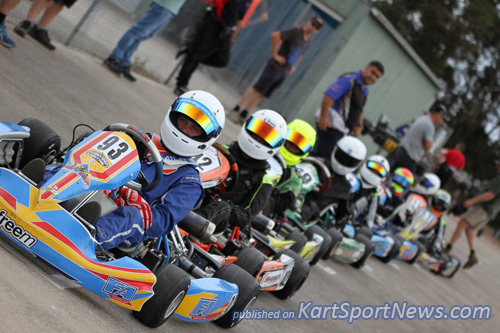 Competition in the Junior Light resulted in last season’s third placed finisher Jaxson Cox getting away to the best possible start winning every event of the day against twenty plus competitors. New to the class after finishing second in Cadet 12’s last season Amber Miller, proved to be the main challenger to Cox whilst Jack Hutchins who finished third last season got away to a consistent start with third place finishes throughout the day. In the fourteen lap final Cox led from start to finish winning by just over four seconds whilst Miller who ran a fast lap of 45.842 seconds had to get past Kai Upiter and Hutchins as they and Jai Sparey had a great battle for second to fifth. 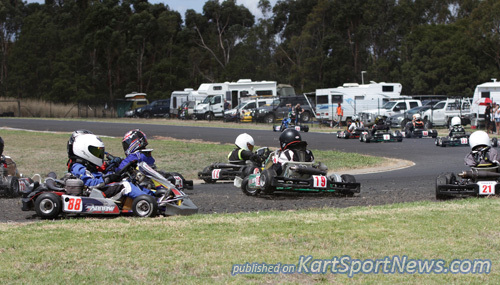 A smaller field in the Junior Heavy of seven drivers lined up for the first round of the series and despite a last placed heat result Benjamin D’Alia went on to win the pre-final and the final to secure top place for the day with Michael Clemente second and Wil Kelly-Merrifield in third spot. Clemente led the final from lap one and it took right until the final lap of the race for D’Alia to make a move past and secure victory by the very slim margin of .049 of a second. Jacob Dowson clean swept the top places in the Senior Light with Brittany Hall the most likely challenger after her second place finishes on the way to the final. However in the final Hall didn’t finish when on lap three after a racing incident and Douglas Jackson was able to chase Dowson across the line in second place after securing second spot on the second last lap getting past Haiden Smith with Smith back in third at the finish. Dowson won by a massive ten second distance back to second setting a one lap time of 44.625 along the way. 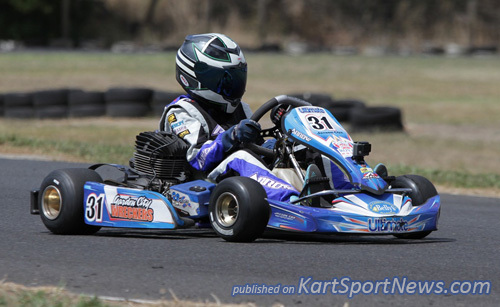 Aaron Jackson displaying a new sticker kit with black plates which he was awarded at the Victorian State Cup in Albury in December returned to the VCS with even more pace and proved to be the driver to beat in the Senior Heavy class winning all four events for the day with Hamish Ribarits and Remo Luciani locked in battle for second and third places. Jackson went on to lead all fourteen laps of the Heavy final with almost five seconds the gap back to Ribarits when they reached the chequered flag. 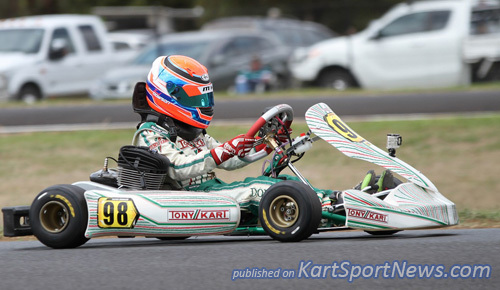 A big win for Jackson over Luciani who has been on track for thirty years and can still out fox most Karters. Jackson’s best lap time would be 45.154 and Luciani would finish .6 of a second behind Ribarits in third spot. 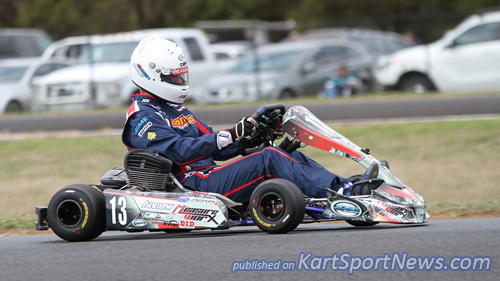 Jackson who finished sixth in last season’s points has last year’s winner Luciani behind him in points early in the season; it should be a great season for the KA3 Senior Heavy. Bronson Boult secured the day’s top result in Cadet 12’s despite a challenge in heat racing from Will Harper who secured a race win. Matthew Domaschenz turned around a twelfth placed heat result into a second place finish in the final showing that he will again be on Boult’s hammer this season. 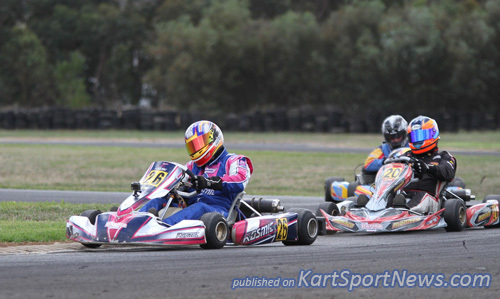 Harper led the first three laps of the fourteen lap final with Boult in second before a pass was made on lap four by Boult and Domaschenz pushing Harper back into third place. 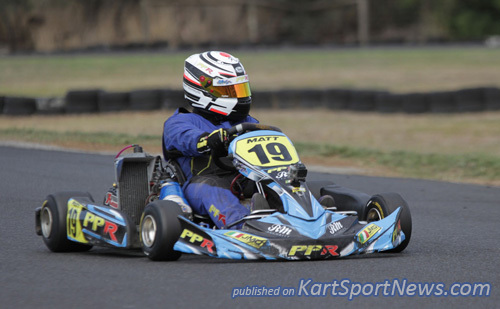 Harper rallied on lap six to pass Domaschenz who moved back past him on lap seven and the positions remained Boult with a fast lap of 48.080 and a two second win distance, Domaschenz and Harper to the finish. A major wreck during the race affected a number of racers in the top ten at turn two, some racers were left out of the race whilst others were way behind the leaders on time and distance as a result of the incident. 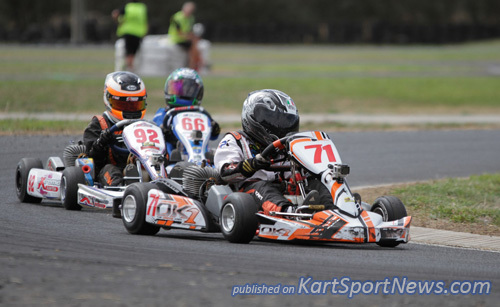 Brayden Flood had the perfect day in the Tag 125 Restricted as he followed up his top qualifying to win all races and finish ahead of Jimmy Mason and William Hall in a great twenty Kart field. Last season’s point’s winner Flood started this season where he left off last whilst Mason who finished eighth last year will be delighted with his great start to the year. Everything went pretty smoothly accept for the need for a restart in the first heat after a messy start resulted in the stewards calling the field back together for a restart after several drivers tangled or took to the dirt to avoid crashing. In the final Hall, Clint Hobbs and Mason where stuck in a battle of their own with Flood out front, it took until lap four before Mason secured second spot. Flood had a best one lap time of 44.850 in his three second win over Mason who ended up gapping Hall by almost six seconds. Flood, Mason, Hall were the final three. Last season’s Tag 125 Light champion Ashley Lear who had to beat Brad Marsh-Stepney in the last round of the series to secure the championship is going to have some extra challenges this season if the first meeting is anything to go by with Kyle Rethus on his home track winning all and finishing ahead of Zac Soutar and Lear for the day in a field with thirty two Karters. At the front in the final there was a bit of a freight train with Rethus leading the field. Last season’s runner up Marsh-Stepney who began in position two encountered drama in the final when he had motor issues at the start dropping back to eleventh before tangling with another racer coming through the field and finishing down in the official placings. Positions second to seventh were secured comfortably by those drivers with around one and a half seconds between second to fifth most of the distance. Rethus completed a best time of 44.291 second on lap seven securing a two second win over Soutar, Lear, Jordan Rae and Jordan Pianezzola. Henry Johnstone proved to be too strong in the KA3 Juniors whilst the days KA4 Junior Heavy winner Benjamin D’Alia managed to secure a fourth place finish for the day in this class. Cooper Hay was right in the mix until the pre final and final where he found the going tough. Jay Coul held the lead in the final for the first five laps of fourteen with Johnstone back in third. 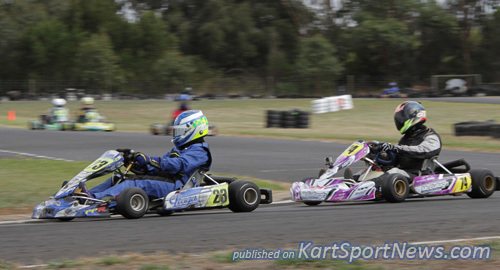 Jason Bowyer had a run with the lead from lap six through to Johnstone finally hitting the front on lap ten and going on to win from Bowyer and Coul with Hay penalised in the final finishing officially in eighth. Jackson Rees was the fastest lap setter in the final with a 44.450 and Johnstone’s win was by the incredible margin of .190. The results sets up a great season for the class with last year’s runner up managing only fifth at the first event. 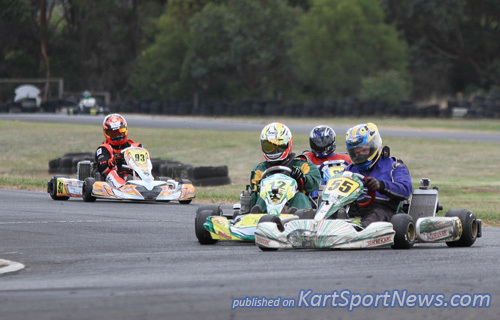 Action in the Senior Masters was fantastic with Ian Branson, Phil Smith, Remo Luciani and David Rinaldi swapping positions around through the qualifying, heat, pre final and final before Luciani got the better of them all with a win in the final from Branson and Rinaldi. 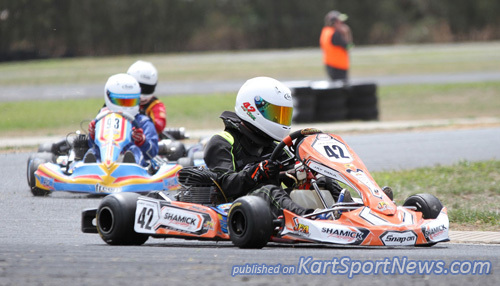 Steven Malkin proved to be the driver to beat in the Tag 125 Restricted Masters class winning all competition for the day ahead of Andrew Stubbs despite Stubbs holding the lead for a while in heat one. 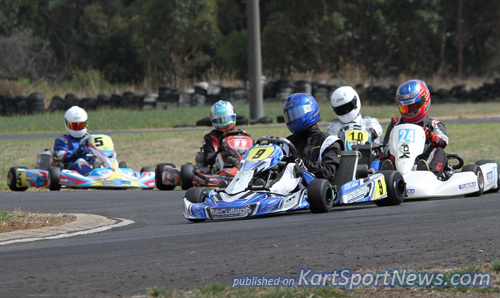 Fraser Lockhart, Ronald Taylor and Matthew Crane had great battles throughout the day before Lockhart came out on top in the final to finish in third behind Malkin and Stubbs. Stubbs held the lead over Malkin in the final for the first six of fourteen laps before Malkin made a pass into the lead. Malkin winning by .7 of a second and setting a one lap time of 45.768 along the way. 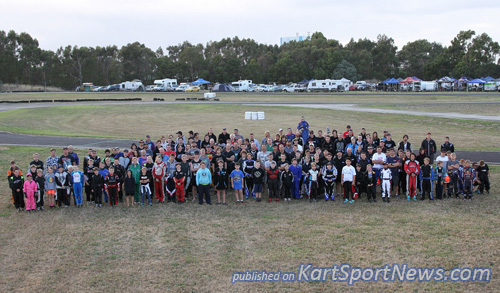 Sixteen Karters made the show for the Cadet 9 class for 7 to 9 year olds, last season’s ninth placed racer Brocklan Parker proved to be the gun driver at the first show of the season with victory ahead of Ben Holliday and Lachlan Brady. 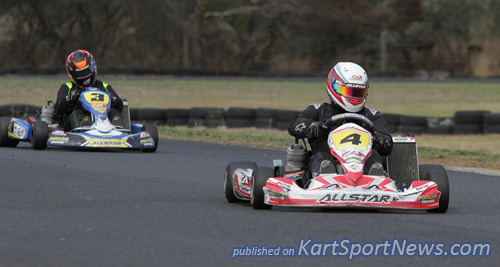 Ruby Gibson was in amongst the lead drivers also securing a second place during heat racing. Parker led all fourteen laps in the final with Brady chasing for ten of those before Holliday secured a pass to take second. Parker’s best lap time was 50.134 seconds in his 2 second win and wasn’t the faster of the final though, that honour went to Sam Whiteford in fifth spot with a 49.991 lap time, whilst at the finish line you could throw a blanket over second back to fourth and cover them all with .510 the difference between those three. 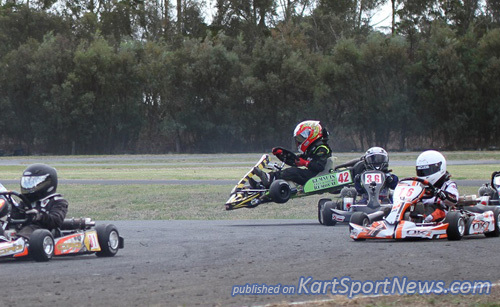 Above: A first corner drama unfolds as karts scramble to avoid a stationary in turn 1 in Cadet 9. that’s Annalise Ellis in the air. Michael Angwin blitzed in the start to the TAG 125 Super Heavy season winning all competition ahead of Dale Paterson who eventually got the better of Andrew Hayes after Hayes out qualified him before finishing ahead in the first heat. Angwin had a great battle with Hayes in heat one with Hayes getting the jump & holding the lead for a few laps. Angwin led the final all the way with Hayes second for seven of the fourteen laps before Paterson passed and held down second until the end of the race. Paterson completed the fastest lap of the race on lap eight as he put himself into second spot running a 46.436 time finishing just over a second behind Angwin at the finish line with Hayes back in third spot. Last year’s season winner Hayes sit in third place after round one. Scott King was undefeated in the Tag 125 Heavy class through all four events whilst action between Adam King and Bradley Anderson resulted in results being much closer with Anderson securing second in the heat after King out qualified him. 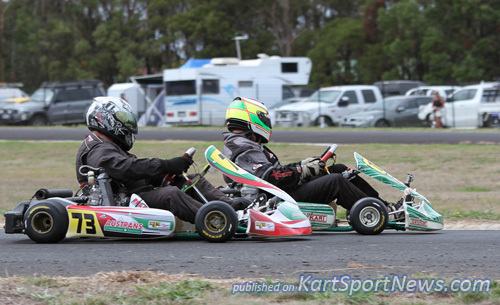 King then finished in second in the pre final and the final where Adam trailed Scott (brothers) the complete race distance. Daniel Rethus held third spot in the final for ten laps before Anderson got past however it was too late to reel in second place. Rethus remained right behind Anderson whilst Mitchell Branson & Paul Feely caught up in the closing laps. Last season’s champion Scott King set a time of 45.063 on lap eleven as the fastest in the final ending with a three second distance back to second. Setting a one lap time in the final of 45.863 Matthew De Stefano went on the secure a strong two second win ahead of Ben Armstrong in the Tag 125 Restricted Heavy class where a whole lot of new faces secured great results with last year’s series top three not involved. Armstrong was never able to get past De Stefano over the fourteen lap distance, De Stefano securing a clean sweep of all events for the class to complete his day behind the wheel. Barry Clough had around nine second between he and fourth spot and secured a strong third place finish. 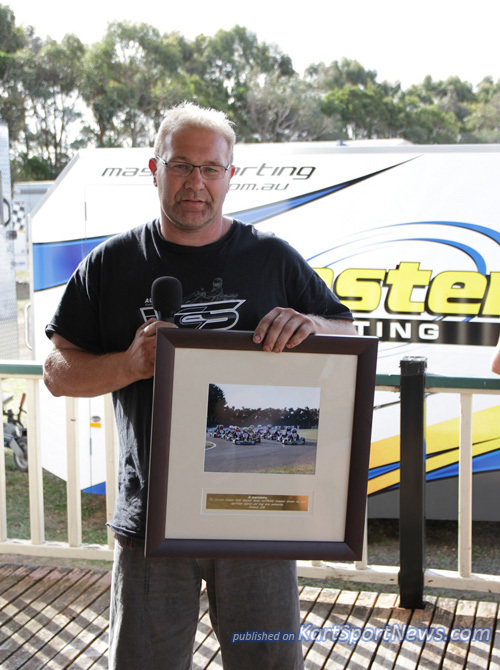 At the presentations Michael Angwin on behalf of AUSTRANS Container Services accepted a plaque in recognition of the companies long running and significant contributions to the Victorian Country Series. Angwin thanked the series competitors and committee and shared that the company primarily contributes because they love supporting Junior sport and Juniors play a significant part of this series. Some Kerbrider of the day prizes were awarded which includes race boots, wet weather race suit, gloves, a Kart cover, Oils, Lubricants and Sprockets. These awards are decided upon by Stewards in regards to whom they deem the best and fairest drivers of the day. Bronson Boult won the award for the Cadet’s, Amber Miller in the Juniors and Senior went to Ian Branson. Above: A plaque of appreciation was given to AUSTRANS for their long running support of the series. The plaque was accepted by Michael Angwin on their behalf. Round two will be at Portland on April the 10th.